In an effort to clarify identified issues around compensation, accountability, fairness, transparency and expectations of faculty roles and responsibilities, the Department of Family Medicine is currently working to review and refresh our Department’s Governance and Accountability environment for all faculty members. At the end of 2016, a review of the DFM compensation model was initiated by HealthIntelligence Inc. with a report on recommendations provided in March 2017. The results of this report revealed a need for the DFM to better define our roles and function, to update our governance structure and develop an accountability framework. Accordingly, three Working Groups and a Governance and Accountability Steering Committee were established to advise the process. We want your input! As a faculty member, your thoughts and opinions are paramount to ensuring we develop a strong Governance and Accountability framework for the DFM. Over the next few months, we will be asking for your participation in this important process. Thank you to everyone who participated in the Governance and Accountability Consensus Retreat on Friday, November 3rd at our new teaching space at 850 Peter Morand Crescent. It was a very engaging and productive day. Participants collectively agreed on a plan to move forward to better understand our role as academic family physicians, and to clearly define authority and decision-making in a governance model that recognizes our faculty contributions through a robust accountability framework. Our hard work will build a strong foundation for our Department for now and in the future. A summary of the day's discussions and action items to guide our next steps are included below. "We're all stars - we might just 'twinkle' in different ways." 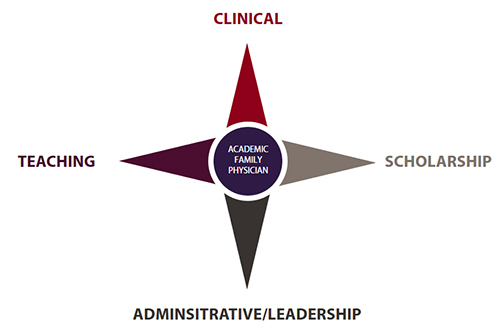 Faculty members were able to identify with the four domains of the star (pictured left): Clinical, Scholarship, Administrative/ Leadership and Teaching. These are all present in some way for every Academic Family Physician, but may ebb and flow throughout one's career. A true definition will account for this fundamental core, be dynamic and allow for growth and promote engagement in the four domains. ACTION ITEM: Working Group 1 to prepare a comprehensive definition of an Academic Family Physician that is clear, inclusive, and that our faculty members identify with. 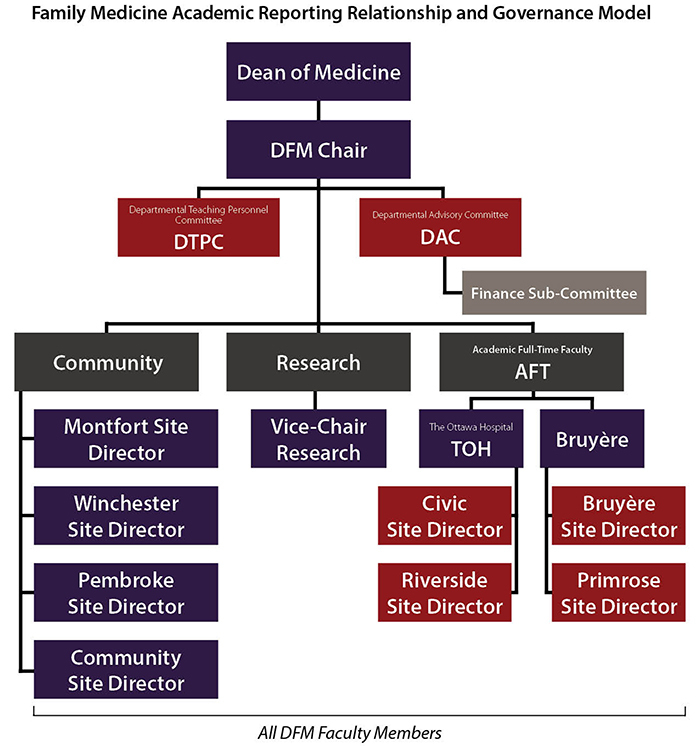 Discussions around the Department's governance model indicated a strong need for clarification. A proposed model was presented, based on findings of the working group and feedback from the Faculty Retreat in October. Three scenarios were presented to the group to test the model's function, which brought up questions related to decision-making, dispute resolution mechanisms, as well as the roles and authority of DFM Committees and the FMAO. The Chair and Working Group 2 were tasked to consider the concerns and develop an expanded model that is clear, transparent and will best serve our faculty. ACTION ITEM: The DFM Chair to meet with the lead of FMAO and Working Group 2 members to prepare an updated governance model that clearly defines authority and decision-making processes. The group agreed to move forward with this approach. ACTION ITEM: Establish a new Working Group to develop a plan to identify and define core and additional activities, and a clear and fair point system. Thank you to everyone who provided feedback on the definition of an Academic Family Physician. We are pleased to present the approved document. At our Consensus Retreat on November 3 2017, members of the faculty came together to participate in a retreat to better understand 1) our role as academic physicians (see above), 2) to define authority and decision making and, 3) to recognize the contributions of our faculty through an accountability framework. Moving forward, the Chair and the Governance Working Group developed an expanded Governance model which is clear, transparent and will best serve our faculty (see below). The Finance Sub-Committee was approved at the Departmental Advisory Committee (DAC) on April 12, 2018. The role of the Finance Sub-Committee is to advise and assist the Chair in the management, oversight and good stewardship of the Department’s financial resources in a manner which is sensitive to the Department’s academic mission, its strategic plan, its commitment to its faculty, staff and partners, while being financially responsible. A points system will aid in the redistribution of a portion of clinical earnings to recognize the important contributions for everything academic physicians do in addition to clinical work. The points system will acknowledge that everyone has a different “share” of admin/teaching/research and will recognize that each are important for our department to succeed. The points system should not disadvantage any faculty member and should allow for fluctuations beyond one’s control. (eg number of residents, success of grants from one year to the next). There will be a guaranteed base income that requires a certain base point count. A merit pool for points above the individual base would be shared once a year. There will be a cap on the number of points recognized. We hope to be able to pilot an accountability framework in July 2018. We value your feedback. Please ensure your voice is heard throughout this process and participate where possible. If you have any questions, concerns or other feedback, please do not hesitate to contact Asiya Rolston.